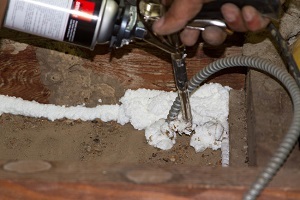 Air sealing gaps and cracks upgrades your home's efficiency and makes your insulation more effective. Every attic has gaps and cracks that allow air flow. These can be flaws in the home's construction, the result of electrical or HVAC work, or simply the result of natural wear and tear. However, they were created, these areas of air leakage have a significantly negative effective on your home's energy efficiency and comfort. Attic Systems specializes in identifying these problem areas and providing complete air sealing services. This process, when combined with an attic insulation upgrade, will help improve your home's energy efficiency and comfort. Call us today to learn more about how we can help you and get quality air sealing for your home. To understand why you need to air seal before you insulate, it's important to understand how air flows in your home. In the winter, the air you pay to heat will leak through the gaps in the ceiling into the attic, which makes your rooms colder and causes your furnace to run longer. In the summer, hot air from the outside moves into the attic and heats up the rooms directly below, forcing your air conditioner to work harder. These problems are made worse if you have ductwork in your attic. The air sealing process begins with testing the attic to find where the leaks are. Once identified, we use an expanding foam to seal gaps and cracks and prevent air flow. This process is will make your insulation more effective and will help improve energy efficiency and home comfort. For homeowners who are struggling with uncomfortable rooms and rising heating and cooling costs, air sealing is a great place to start your improvements. Attic Systems can help you identify the problems in your attic and provide you with complete air sealing and attic insulation services. Contact your local dealer to get an estimate on air sealing services for your attic!